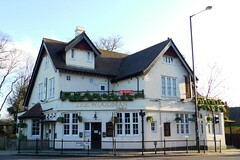 A spacious pub by Highgate Station in leafy Highgate. As far as convenient places to meet go, there are certainly far worse places than this one. It has a large beer garden area out the side (along Wood Lane), which is accessibly from the street. Inside there's plenty of space, with a smattering of large wooden tables as well as smaller booths around the edge of the several rooms. There is even a long room laid out like a banqueting hall, which looks like it could hold 40 or 50 people. The four handpumps showcased a largely Greene King range on a September 2008 visit, with the Greene King IPA, Abbot Ale and Old Speckled Hen, as well as Wells Bombardier. There's a short wine list, with wines at around £3.50-£4.50 for a small 175ml glass. Food is served courtesy of 'Xavier's Kitchen', which has a daily menu. Our group sampled the bread basket (available in two sizes, either £1.50 or £3), which was a good amount of bread, and perfectly decent too, though the staff neglected to offer a knife for the butter. Ewan's pan-fried mushrooms with salad and toast was another starter course (£4) photo, but even more substantial, with a good helping of salad, nicely seasoned and with fresh ingredients. The mushrooms themselves were perfectly juicy and well-presented. We didn't try any of the mains, but these were reasonably-priced from £7 up to £13 for the steak. In general, the only real weakness of this place on our visit was the table service. They tried, at times a little too strenuously, to prevent us from ordering directly at the bar, but weren't always reliable with orders (a pint of tap water never came, and change from payment took 5-10 minutes to return and was handed to the wrong person). However, it's likely this was largely due to new staff being trained on what was a quieter night (Tuesday). Last visited by Ewan and others, 23 September 2008. Last edited 2013-05-10 08:18:11 (version 6; diff). List all versions. Page last edited 2013-05-10 08:18:11 (version 6).